We often let ourselves off the hook as a society when it comes to whether people with special needs are living fulfilling lives or not. Some of us may say well, they were born this way, so that’s the roll of the dice. Or it’s some quotidian, reductive version of the karmic wheel. Or hey, they seem happy, so as long as we give them food, clothing and shelter, we’re all good. They should be content, and if they’re not, keep them away from ‘polite’ society so they won’t bother anyone. The greatest disservice here, to me, is lumping all special needs people together. It is just as damaging as assuming all women think alike, or veterans, or any group that society feels would thrive if there was a benevolent, up-top spokesperson who would simplify the scope of their concerns so that everyone else wouldn’t have to stop and really listen, and respond to the in-depth need, not merely react to the immediate tableau. The main characters are Tracy Thresher, 42, an advocate for people with disabilities, and Larry Bissonnette, 52, an artist, both from Vermont. Both men have autism, and both learned to communicate through typing as adults. Through reaching out online to other autistic people who can communicate this way, they are slowly forming a community, so the movie chronicles their travels to various countries to meet these new friends–to Sri Lanka to meet Chammi Rajapatirana, to Japan to meet Naoki Higashida (the boy who authored “The Reason I Jump”), and to Finland to meet Antti Lappalainen and Henna Laulainen. There are surely many online reviews that would do greater justice to the movie. And the movie is about people speaking for themselves, so really, it would be an exercise in heavy handed misreading if I went into detail that should be reserved for your own viewing. I will just leave you with some of my observations. It’s very moving to see how self advocacy is the main force driving Tracy and Larry. They have lived half their lives with autism, and have seen public opinion shift. In a way, they embody the effects of public policy through how their lives have turned out. And the fact that they feel a responsibility to make their concerns known, and to reach out to younger people who have the same path to walk, is just incredible. Throughout the movie, they keep typing out how stifling it is when there is no way to show their intelligence to others, how everyone wants to communicate, and how important it is for people with disabilities to have a sense of purpose and optimism. If there was any doubt about how important it is to offer that hope to the disability community through societal inclusion and practical provision of needed supports, I don’t know what else can be said that is persuasive enough. The filming techniques are perfectly crafted to allow for this self advocacy too. Very little overarching narrative explanation is given, thus allowing for the autistic people’s typed (and some spoken) words to be the main stars. Some of their words have been set to music and are the soundtrack for the movie. It’s both powerful and humorous, especially when Larry doesn’t want to take his shoes off at a Buddhist temple and the soundtrack reflects his words: Leave the boys alone! I love how, woven through the movie, are the realities of living with autism. As the men travel with their assistants, they have to navigate eating foods that are out of their comfort zone, cope with no-shoes customs in Asian temples, transfer their life skills to new settings like hotel rooms, try not to melt down when they have sensory overload in public places, and use their typing skills in conference settings and also to meet their new friends. Larry is the classic loud American traveler, easily confuzzled by new experiences and not as open as Tracy is to different cultural practices. I laughed and teared up at how perfectly these vignettes showed their unique personalities–Tracy wants to eat foods that move, and Larry wants a Budweiser–but also the affection and profundity of thought that flowed between the two men as they typed and processed their reactions in each country. When they were able to have a deep exchange about how they can understand spiritual teachings despite “autism’s death grip on [their] actions,” I could barely speak myself. 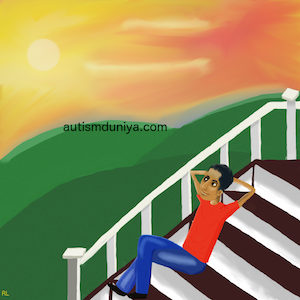 The developing friendship between all the autistic people is the dhal and roti of this film. Chammi, the young man in Sri Lanka, writes wistfully after meeting Larry and Tracy, “Feasting on my friends company I store up memories.” They are inevitably sorrowful to leave one another, and even the caregivers shed tears. Life with autism affects us all profoundly, and we all benefit from like minded communities. The new friends discuss advocacy, attend conferences together, have meals out together, and throughout, the scenes when they sit typing and occasionally vocalizing (Naoki reads out his words in Japanese in a determined staccato that is wonderful to listen to), surrounded by their caregivers and assistants, are my favorite. The effort and industry in the room when they are typing–we cannot help but have our minds opened by watching this. When overwhelmed by the task or by the emotions they are expressing, they sometimes melt down. Chammi is asked why he has to get up and walk around at times, and he says it is “killingly hard to figure out the pattern of movement I need to type out my thoughts.” Sometimes it is due to other issues interrupting the flow of thought–fatigue, hunger–and it is difficult for them to put aside the task and say Hey, let’s eat and then talk some more. Naoki calls them the World Intelligence Magnified Tour. Their reason for being is to express the diversity of human capability and thought, and their mission is to spread this awareness. My sister, who watched this film with me, said it was like the X-Men, and she’s right. They define their otherness but still want to serve the world in a meaningful way. Antti gives the group the label of poor wretches, as opposed to the jabberers, those who speak and have some control over their own destiny. I find it very important that Antti labels himself this way. As adults, most of the characters have experienced being isolated in the education process, and not being allowed to learn to their full potential. Forced to engage in repetitive tasks that don’t interest or challenge them, exposed to typing communication only when they were older, and therefore limited in their career potential now, I think their voices are very much needed. They make us reevaluate what programs we fund that may not be the best fit for autistic people, and we need to feel the horrific self doubt and crushing awakening that a society should really experience before we can move forward in a way that properly takes into account what many autistic voices are telling us they want for their lives. Antti is shown spending his day communicating with a PECS system at his day program, but he can read, and he types when he is with his father. I’m sure things have changed since the movie was made, but I felt so frustrated watching him submit to tasks that were lower than his ability. He and Henna are so cognizant of the likelihood that nothing will change for them. It depressed me. He shouldn’t have to say only peppy things so that we can feel okay about how he is progressing. His life is at a standstill, and we must not be fine with a young, intelligent guy not having a way forward. Larry subtly calls out an interviewer by saying that thirty years ago, no one would have asked them any questions, so the fact that autism is now a trendy topic shouldn’t be the only reason that people want to learn more. All the main characters describe the profound impact that communication has had on their sense of self. They can fight back against people’s misconceptions of their intellectual capabilities, they can form connections to others, and they no longer feel caged and shut away. How much more they could do, how much more self determination might be possible, if they could count on long term supports that were tailored to their needs, and could adapt with their capabilities. Larry is shown in his true element when he is in his own home, able to contribute to household tasks and share a meaningful family life with his sister, and especially when he is painting in his studio, his physical movements no longer jerky or hesitant, but sure and confident, his gaze focused, and his life’s work clearly laid out for him. Tracy’s life seems to be his work. His tears when he speaks of not having a permanent home, having to stay in various individual or group homes during the week, and having to adapt his senses to each new environment, are what we all fear will happen to our kids should they find themselves without a stable family. He goes to his team meetings to advocate for himself. And he attends a meeting with Phil Scott, Vermont state senator, where he expresses his concern about budget cuts and how they will affect disability recipients. He becomes so distraught while typing that he cannot finish and then berates himself when he can’t finish out the meeting. It is heartbreaking to watch, but Tracy’s courage in offering himself up as an example of what people with disabilities can do, and how they break down when obstacles are placed in their path, is something we cannot turn our faces away from. We should not, if we want to call ourselves good people. That brings me to the amazing role played by all the caregivers and assistants. I hope more people will see what career opportunities are out there in the field of special needs, and I also hope that states and countries will pay them what they are truly worth. When Tracy’s assistant, Harvey Lavoy, is talking him through his meltdown at the meeting with the senator, he never interjects or takes over; treats him with respect as the adult and equal he is; and is such a thorough professional. Pascal Cheng, Larry’s assistant, is a quirky observer of all the details of their travels, and his gently offered analyses of things going on around him help ease Larry’s moments of crises. And Chammi and Naoki’s moms are my heart sisters. They are the champions of their highly kinetic sons, willing to try anything, worn out from years of parent advocacy, and brilliant at the cobbling together of resources and support systems that have been lacking around them. It is worth mentioning that Chammi’s adult situation is the least supported of all the characters. As South Asians, I hope we can reflect on that and keep working on developing the needed infrastructure for these countries where family is our everything until there is no more family left. In a big picture sense, it is so generous and honest of all the main characters to let us see how the making of the movie lit a spark in them. We are asked to reflect not on what communication is for, but on the act of communication itself. What a step that is for people who do not take communication for granted. What a dance hall it is, how all of humanity should be welcome to learn the steps, and how the sharing of ideas shapes that dance. At the Buddhist temple in Japan, Tracy is able to articulate his existential questions to Monk Hogen. There is no room for sarcasm. He is serious in expressing how his greatest anguish is not having a purpose in his life, and the monk replies with no condescension towards his disability, expecting the same of him as of anyone else–you must set your own purpose. Just as we accept how and where we are born, we must accept the circumstances in which we find ourselves, then set our own goals. And we see Tracy carrying that resolve forward. Everyone needs a mentor at some points in their lives, and the beautiful completion of the circle is this movie’s gift–that communication allowed Tracy to ask this profound question, and that the answer allowed him to see the higher purpose of communication. It gave him the battle cry to win at life’s struggles. Long may we all prosper, this philosophical and practical army of Wretches and Jabberers. Wretches and Jabberers. Dir. Gerardine Wurzberg. Perf. Tracy Thresher, Larry Bissonnette. State of the Art, Inc, 2010. DVD. P.S. My sincere thanks to Ruth B, my fellow autism mom, for recommending this movie to me. Radha, I taught a module last semester about academic writing for a wider public audience, and one of the tasks was a film review which was supposed to teach the students how to draw film into advocacy through their writing. As we start a new year, it strikes me that this post is a wonderful example for me to show my students – a film review that is written for the purpose of advocacy, but also a review of a film that is about advocacy. I love the respectful and thoughtful perspective your writer’s voice conveys here, as you navigate your own desire to engage in advocacy through very real issues of authenticity of experience and right to speak. I loved watching this film with you. The film of course was amazing in all the ways you say. But I also watched as your body responded to the film – your eyes tearing up when something in the film triggered your ever-present fear for your son’s post-parental future, your hands twitching as you recognized a specific behavior because A displays those too, your glances of solidarity at G because she was the only one in the room who shared your intimate knowledge of what it meant to live with autism in the family. And the X-Men analogy – I just want to add that it goes a lot deeper than what I managed to convey that day. The idea that what the rest of the world sees as negative mutation actually carries the potential for superpowers that extend rather than contract the boundaries of human intelligence. Happy new year, my love. And here’s to a wonderful year of empathy, engagement, and efficacy!